Habit: Shrub, tree, armed, generally spreading from underground parts. Leaf: odd-1-pinnate, alternate, deciduous; stipular spines generally not gland-dotted. Inflorescence: raceme, axillary. Flower: calyx bell-shaped, lobes 5; petals 5, white or pink, banner reflexed; 9 filaments fused, 1 free. Fruit: flat [or plump], not narrowed between seeds, dehiscent. Species In Genus: 4 species: temperate United States to subtropical southwestern United States, Mexico. Etymology: (J. Robin (1550--1629), V. Robin (1579--1662), French botanists who introduced genus to Eur) Note: Robinia hispida L. spreading from planted plants in Sacramento River Delta, potentially naturalized. Habit: Shrub, small tree. Flower: corolla 2--2.5 cm. 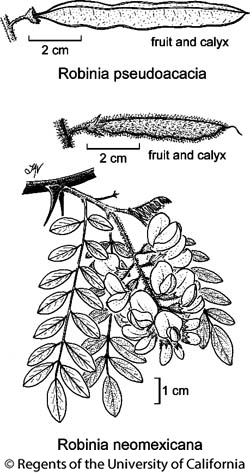 Citation for this treatment: Matt Lavin, Duane Isely & Elizabeth McClintock 2012, Robinia neomexicana, in Jepson Flora Project (eds.) Jepson eFlora, http://ucjeps.berkeley.edu/eflora/eflora_display.php?tid=41517, accessed on April 23, 2019.